Photographing Eastern Newfoundland is full of surprises. Photo by Tracy Munson. 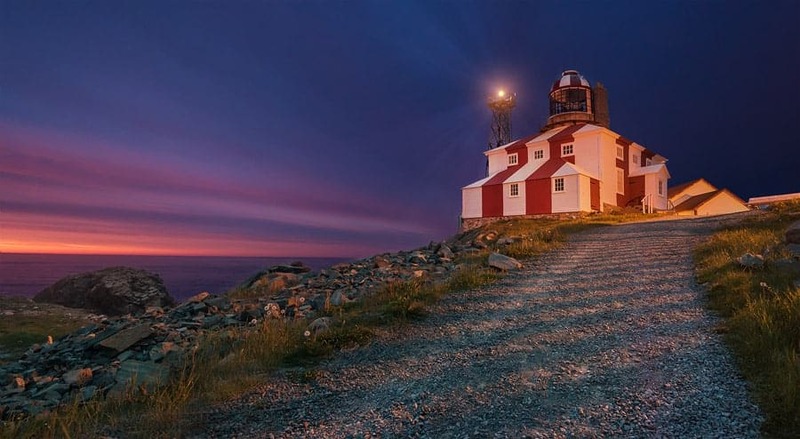 When most people think about visiting Newfoundland (if they think about it at all), they picture the towering fjords of Gros Morne National Park and the colourful houses of Quidi Vidi village in the capital city of St. John's. Admittedly, those alone are reasons enough to visit, but any photographer who passes on exploring the many Capes and Coves of the Eastern shoreline is missing the point. IMPORTANT NOTE! This article is somewhat obsolete now. Since posting this article a year ago, we released an iPhone/iPad app of all the best places to photograph in Eastern Newfoundland (and around the world). It' s a free app called Really Good Photo Spots and you can download it right here. The spots in this article are in the app, but also there are MANY MANY more in the app than in this article. So enjoy this excellent primer on Eastern Newfoundland by the very talented Tracy Munson, but be sure to check out the app too. 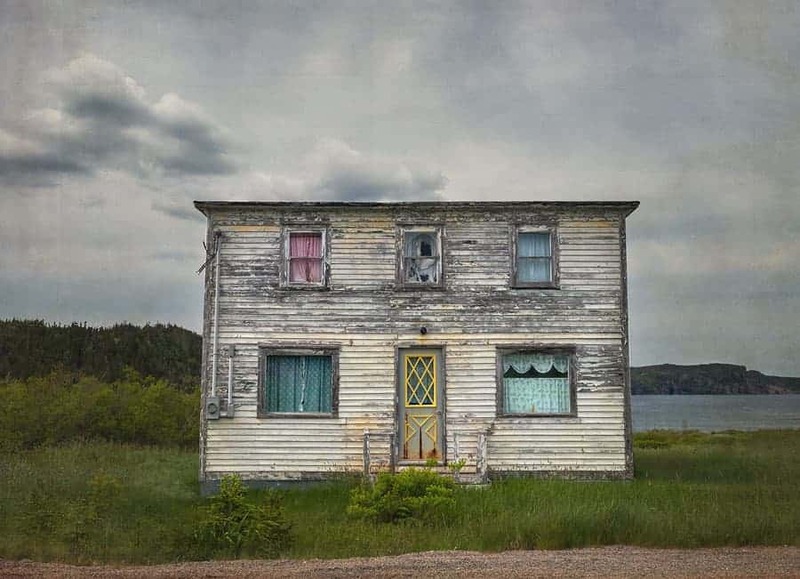 Newfoundland is a unique place of starkly beautiful landscapes and the tattered remains of times past, still hanging on by a thread in the ever-encroaching modern world. A simpler, yet unimaginably challenging way of life persisted in many villages along the Eastern shore until relatively recent times, decades longer than in most places in Canada or the US. There really is no place like it, but for lovers of crumbling and forgotten places, the time to visit is now because the environment is harsh and the fabulous decrepitude won't last forever! 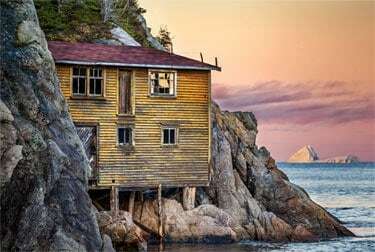 Newfoundland deserves a spot among the ranks of places like Hawaii and Iceland as a dream destination for photographers, but you will find it much less overrun with tourists. In fact, if you're tired of standing in a crowd of photographers taking the same photo in Antelope Canyon, you will find most of Eastern Canada refreshingly lonely. An iceberg at sunset, near the iconic yellow house on the rocks in Shoe Cove, Newfoundland. We went to see a moose cow with a newborn baby that had been seen next to the pond in the middle of town, but they were gone and we had to settle for this scene. Photo by Tracy Munson. A small but comfortable berth for 2 on the ferry from Sydney, NS to Port Aux Basques, NL. This area is most easily accessed by flying into St. John's or Gander, Newfoundland or by taking one of two ferries from Sydney, Nova Scotia. Flying has an advantage because those ferry rides are LONG (one route takes 6-8 hours, the other 10-12) and not inexpensive, especially if you have a large vehicle or RV. If going by ferry, it is well worth it to travel by night (why waste a day of your trip?) and splurge on a berth. 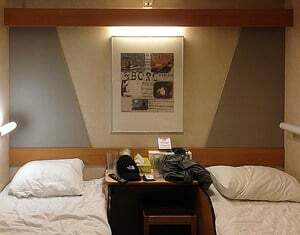 I was amazed at how comfortable it was and slept like the dead, despite my excitement to arrive and anxiety about the dogs who had to stay in the car below deck (they were fine). If you have arrived without a vehicle of your own, you will want to rent a vehicle. Something with 4 wheel drive would be a good idea because many of the roads I am about to send you down will be among the worst you have ever seen. When you get back home, that pothole in front of your house that you've been writing the city council about for years is not going to seem like such a big deal anymore. Weather can be extremely unpredictable. So unpredictable, in fact, that one resident told us he keeps a snow shovel in the trunk of his car all year round and there is not a single month in the calendar that he's never had to use it in! You will also want good brakes and fast reflexes because the island is (allegedly) lousy with moose. I say allegedly because after hearing story after story from people who said they quit bothering to stop to take photos of moose because they saw so many, we got skunked. In a month-long road trip around the island, we saw a grand total of 3 moose. Two were from a great distance and a third was dead in the back of a pickup truck. We visited the village of Shoe Cove on a day when a moose cow had reportedly given birth to a calf and was hanging around, but not by the time we got there. The hostess at our B&B told us she had seen as many as 14 moose in a single trip down that road, but they were all hiding when we were there. This article is not about photographing moose, though I sincerely wish it was! 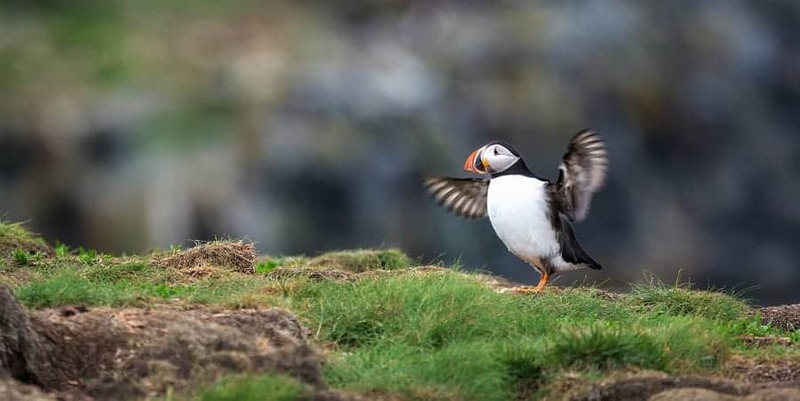 An Atlantic Puffin spreads his wings and dances a little jig on the edge of a cliff, near Elliston, Newfoundland. Photo by Tracy Munson. There's a bit of a fine line you walk when choosing when to visit Newfoundland. You have the best chance of seeing icebergs in late May and early June. Before that, the bergs may still be ice-locked and the weather quite unpleasant. The further north you go, the longer the season lasts and you may still see icebergs in northern Newfoundland and Labrador in late summer. We arrived in mid-June and saw plenty of large icebergs along the northeastern coastline, which we headed to immediately upon arriving. They were gone from the area around St. John's and south from there at that time, but we saw them again a couple of weeks later when we visited St. Anthony's at the northern tip of the island. Spring can also be a good time to see wildlife. Migrating birds are arriving and the (alleged) moose are having babies. The proprietress at our B&B in La Scie told us they'd had a polar bear in town three weeks before we got there! Not a common sight that far south, but only likely to happen more frequently as climate change forces them to seek food beyond their normal range. One interesting but gruesome point that a Newfoundland tour guide mentioned in a presentation I attended recently was that visiting the puffin colonies is best done in the early summer. Once their adorable babies start emerging from the burrows later in the season, the gulls, gannets, and raptors begin picking them off and the scene becomes…unpleasant. Yikes. Oh this? Just some average, run of the mill scenery by the side of the road, near Elliston, Newfoundland. No park, no sign, no fanfare, no guardrail. Nothing to see here. Photo by Tracy Munson. While the west coast of Newfoundland heads north in a fairly straight line, the eastern coastline is a mess of long peninsulas, twisted with coves beyond counting. Though the area to the south of St. John's is well worth a visit, it is also one of the most visited and “touristy” parts of the province. 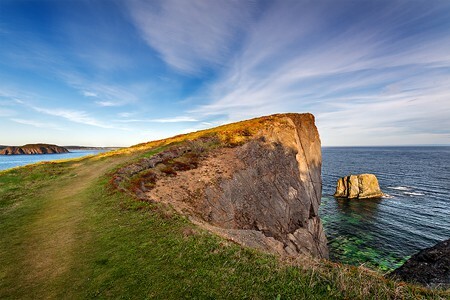 Don't let that put you off, because Newfoundland's “touristy” is every other place's “off the beaten path” and their “off the beaten path” is like nothing you are accustomed to. This article will focus on the area north of St. John's because I think it is so neglected on many visitors' itineraries. If you stay on the main highway, the TransCanada then you will miss everything. The key here is to drive along the winding coastal roads of each peninsula and cape, exploring the coves and sea stacks and fishing villages along the way. One of the crazy things about NL is that stunning vistas with sea stacks and cliffs that you would expect to line up and pay admission to see anywhere else, don't even rate a park here. It's just everyday scenery at the side of the road. Another thing to bear in mind is that…um…well, there's no delicate way to put this, but the Newfoundland government doesn't seem to overly concern themselves about reckless people falling from cliffs. You will not find guardrails or even warning signs in most of these places, even the ones that are in parks. Major bonus for CAREFUL photographers who don't need a fence obscuring their view. Please use common sense and don't blame me when you plummet to your death on the rocks below. Incredibly strong winds can come out of nowhere, out on “the rock” and no shot is worth the risk. Same goes for exploring abandoned houses precariously perched on a precipice and even for approaching wildlife too closely. Moose may look stupid…moose may BE stupid, but just like many stupid people, they can be extremely aggressive and dangerous as well. Houses hang on (barely) to the rocks in the abandoned fishing village of Round Harbour, NL. Photo by Tracy Munson. A small fishing town that is still populated and operational, La Scie is a great place to see icebergs even if you arrive a bit later in the season. It is also a great place to stay because it has some amenities and is a good jumping off point to many of the abandoned and semi-abandoned fishing villages in the area. One place in La Scie that I can't recommend highly enough is the Outport Museum and Tearoom. Ok, it's not exactly a photography location (although you could get some great photos of the local food and culture there), but it is a regular on the annual list of “Where to Eat in Canada” for a reason. That reason is only partly the food, which is excellent home cooked food but I'll bet there aren't too many restaurants listed in the book that have a menu that is usually limited to one entrée. You eat what they are cooking that night, which might be moose burgers, or the best baked beans you've ever had, or a Jigg's dinner, which is surprisingly better than it sounds. The real reason to go there is the local flavour, from the moment you walk in and are immediately included in conversation with the owners to the moment a kitchen party breaks out, with music and dancing (if you're lucky). See their facebook page (linked above) to see what I mean. Like many of the small fishing communities along the east coast of Newfoundland, Round Harbour was at one time only accessible by boat. Now there is a road, but a few years ago the population of the town had dwindled to one family and they were resettled elsewhere by the province, although one resident continues to fish there. Visiting is truly like stepping back in time and it is easy to imagine the small community busy with fishing boats, though almost impossible to imagine how challenging such a life would have been. Round Harbour is one of those places where you must be extremely careful, not only of your own safety but to be respectful of the properties, some of which may still be visited by the families that lived there for so many generations. 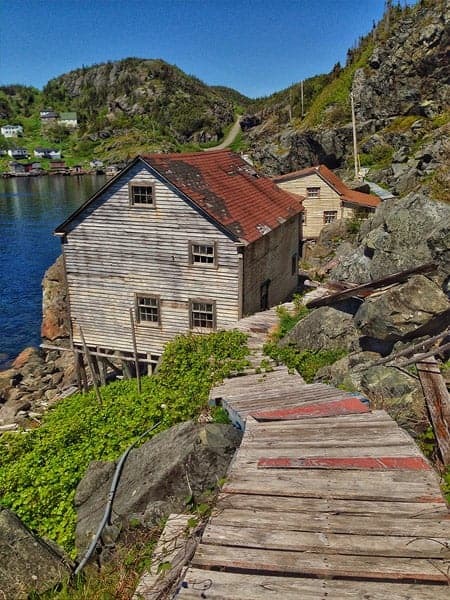 Twice a booming mine town with a population of as many as 2000 people in its prime, Tilt Cove is now the smallest town in Canada, with a population of 6. Another great rurex location with the added bonus of a quirky little museum one of the remaining couples run out of their garage. There are some treasures to be found there, make sure to find the letters from a shipwrecked sailor to his wife for a spine-tingling read. 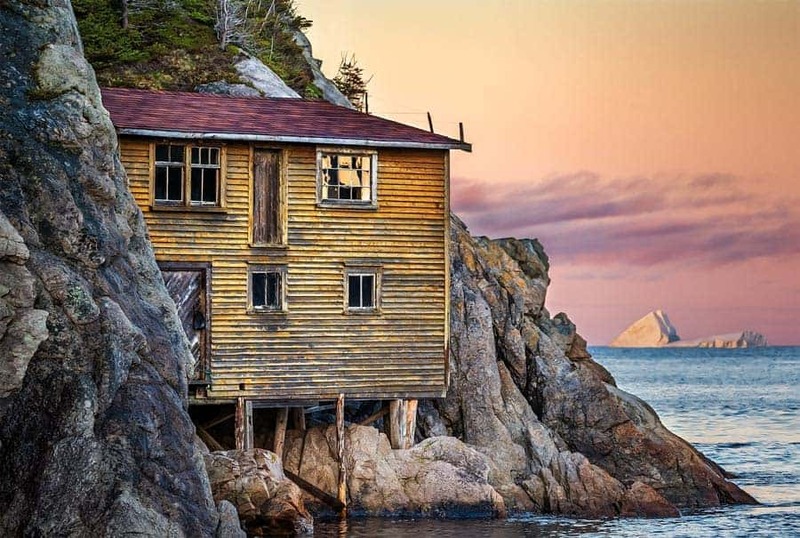 Hanging on by a thread, partially populated and partially abandoned, Shoe Cove is the home of the iconic yellow house on the rocks pictured near the top of the article. This town was one of the first places I noticed houses with wooden candy canes, bells, and wreaths on them…even though it was June. The best explanation I could get from any of the locals was that it is terribly windy there and regular Christmas decorations don't work out so well, so some families nail these wooden ones onto their houses and leave them there year round. Newfoundlanders are a quirky bunch. One of the best places in the world for viewing icebergs, Twillingate sticks out and catches them as the current carries them south from Greenland. The icebergs that we see in Newfoundland were calved off of glaciers two years previous and have been making their way south every since. An interesting aside, iceberg ice is WAY colder than regular ice and if you put a chunk in your drink it will last for a really long time and you can hear it crackling and popping the whole time. You will also be drinking water that has been frozen for 10,000 years! Icebergs are one of the few things that can be best photographed on clear, sunny days because the light gives them that turquoise glow and really shows off the streaks and different colours in the ice. One of many spectacular views along the Skerwink trail, near Port Rexton, Newfoundland. Photo by Tracy Munson. The Skerwink Trail, near Port Rexton, Newfoundland is a relatively short, looping trail. It does have some steep sections, so give yourself enough time if (like me) you are lacking in youth and fitness. The fantastic vistas will make the climbs worthwhile, I promise. 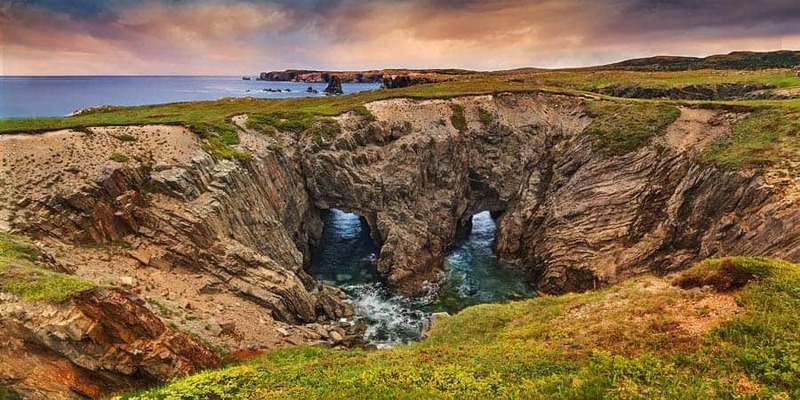 Make sure to visit the Puffin Viewing Site near Elliston, NL and bring your telephoto lens. You can hike out along a peninsula which ends abruptly but then there is an island only a few meters out from the edge and it is just covered in nesting puffins. The birds live in burrows underground and seem to go through periods of great activity, with hundreds of birds coming and going, followed by periods when most are underground. You may want to bring a blanket, a thermos of coffee, a tripod and a book and be prepared to wait for the action. Atlantic puffins are surprisingly tiny so even though you are so close, you will need the longest reaching lens you have available. They do a lot of sitting around and it is easy to get those shots, for a real challenge with a big payoff, try to capture them in flight. They are super fast, so you will need a shutter speed in the 1/1600 second neighbourhood. 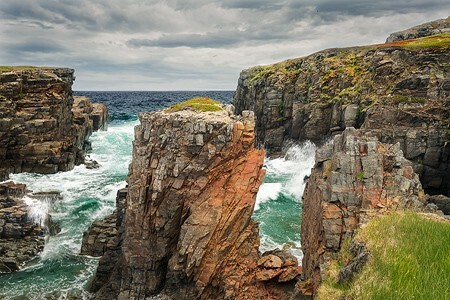 The Dungeon Rocks in Bonavista Newfoundland are on a winding drive past dozens of spectacular vistas and jagged rock formations, with this crowning glory at the end. A neutral density filter, a slower shutter speed and the patience to wait for a big wave to come crashing through the tunnels would have made this photo more impressive. Learn from my mistakes. Water flowing through the tunnels of the “Dungeon Rocks” at Dungeon Provincial Park, near Bonavista, Newfoundland. Photo by Tracy Munson. If you travel the East Coast of Canada a lot (and clearly, I do), then those tall skinny lighthouses become de rigueur. You will see more of the short, squat ones in Newfoundland, probably because of the insane winds, but the candy striped Cape Bonavista Lighthouse is really something special. I missed the best of this sunset there because I couldn't tear myself away from the Dungeon Rocks, which are just down the road. It's always good to have an excuse to go back to such an amazing location and I can confidently say that Newfoundland is a place I will visit again and again. The Cape Bonavista lighthouse in Bonavista, Newfoundland, against the last, fading light of a summer sunset. Photo by Tracy Munson.